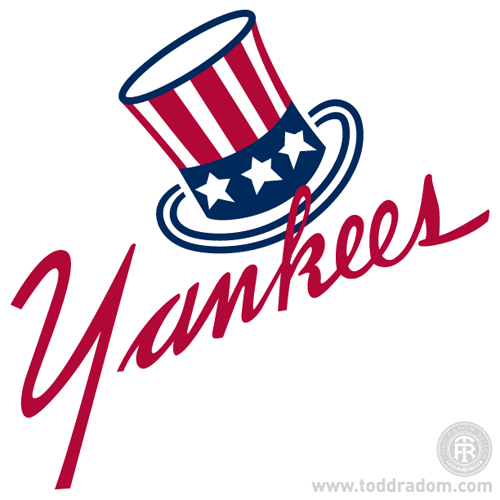 The Yankees' Top Hat Emblem and the Three Logos of 1946. Very few logos of any kind can truly be considered to be "iconic." The New York Yankees' primary logo is one such visual identity. The trademark is now nearly 70 years old. Like many corporate symbols, it has evolved slightly during that timespan. As familiar as it is, its origins and early progression toward what is now so recognizable are not well known. Yankees co-owner Larry MacPhail commissioned the logo. MacPhail was a legendary marketing innovator. He tapped artist Henry Alonzo "Lon" Keller for the assignment. Keller's work was familiar to American sports fans in 1946—he had been illustrating covers for college football game programs since 1932 and his work would eventually be featured on the covers of 14 different World Series programs, from 1939 through 1964. The adoption of an official logo at this time makes complete sense when viewed in conjunction with what the Yankees were doing in terms of marketing and advertising as they embarked on the 1946 campaign. The national economy was poised to explode in 1946, spurred on by the return home of millions of World War II veterans. Smart companies of all kinds ramped up their marketing efforts in anticipation of a postwar economic boom. Prior to the 1946 season, MacPhail had lights installed at Yankee Stadium for the first time. He led efforts that resulted in $600,000 worth of improvements at the Stadium, including baseball's first-ever Stadium Club (available via membership to season ticket holders,) expanded concessions, and new box seats—described as being "five inches wider than anything now in use." Under MacPhail's leadership during the winter of 1945, the Yankees pioneered the promotion of season ticket sales to corporations and to New York's wealthiest individuals. Team promotional efforts also included the publication of a team newsletter, a first for the Yankees franchise. Meantime, Colonel MacPhail has already given the fifteen other big-league magnates lessons in how to merchandise a baseball club. For example, spring training costs the average major-league club anywhere from $20,000 to $40,000. This year MacPhail flew his team to Panama for a pre-spring training workout. The Panamanians gave him a $30,000 guarantee that more than covered the cost. Riding the Panama publicity, the Yankees came back to the U.S. for the regular spring trip and grossed almost two and a half times as much as the best previous year, for a net profit of $65,000. And while MacPhail was taking the sun, business manager Tom Gallery back in New York was selling out the new box-seat Stadium Club memberships to the tune of $500,000--all cash in the till before opening day. The Rambunctious Redhead is not, after all, defiling Yankee history. He's writing it. Keller created the top hat concept, topping the "K" in Yankees with the hat, and creating a Yankee script. The logo was first used on the 1946 spring training roster. This logo was quickly replaced. We can surmise that the roster guide was printed in early January of 1946—the club announced a tentative Spring Training schedule at that time and finalized it on January 22. The next version of what eventually became today's logo appeared on a team schedule that was released prior to the 1946 season. This artwork was also featured on Yankees tickets throughout 1946—presumably the result of all tickets having been printed in the months leading up to the new season. By early April of 1946 the above baseball-less logo had given way to what is clearly the current New York Yankees identity. The franchise has utilized this mark ever since then. There is no definitive account on how the above two pieces of art rapidly evolved into this one (or why they were preemptively launched to begin with.) Whatever the case, the final version has endured, undergoing a few nips and tucks along the way, the perfect visual embodiment of everything that the Yankees brand represents. In early December 1945, MacPhail's new Yankee co-owner Dan Topping announced that he was folding his Brooklyn NFL franchise and moving to the new rival All-America Football Conference. His new team would play at Yankee Stadium and would henceforth be called the New York Yankees. A glance at the timeline suggests that all of this was happening at the same time as Keller's identity development project. Whatever the case, when the football Yankees took the field in September of 1946, this Keller-branded football logo variation served as their official symbol. The football Yankees played the Cleveland Browns for the AAFC championship in both 1946 and 1947, losing each time. The AAFC and the NFL merged in December 1949. The Yankees were not absorbed into the expanded NFL and the team folded. Litigation, the great American pastime. Nearly seven decades after its debut, the Yankees' top hat logo remains one of the most visible identities in American popular culture. In 2009, the family of Sam Friedman put forth a claim that Friedman—a house artist at New York's "21" Club in 1946—sketched what would become the Yankees logo on a napkin for customer Dan Topping. The possibility of this artwork emerging as the Yankees' first official emblem seems implausible when one considers Larry MacPhail's commitment to marketing, advertising, and branding. The creation of a formal insignia for the New York Yankees of 1946—a plum assignment for the most powerful and glamorous sports organization in the world's media capital—would likely have been given to a sure thing, a seasoned professional with vast experience. Logic dictates that there was too much money at stake to have left the process to anyone other than someone of Keller's stature. 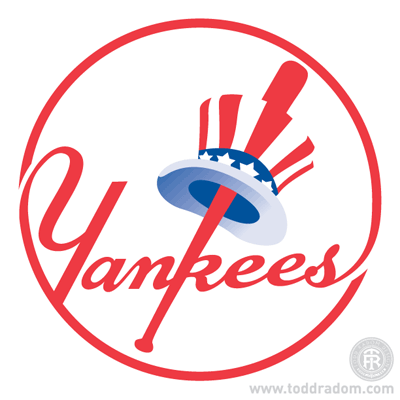 In 2011, a woman named Tanit Buday of Yonkers, NY filed a copyright infringement lawsuit in U.S. District Court in Manhattan alleging that Yankees owner Jacob Ruppert commissioned a logo from her uncle, Kenneth Timur, in 1936. The uncle was supposedly recommended to Ruppert via his manicurist—Timur's sister. The fact is that Ruppert displayed little interest in the way of marketing or branding the club. A 1954 Sporting News article says that Ruppert "abhorred gaudiness and for a long time fought successfully to keep even a modest insignia off the uniforms of his players." The allegations also fly in the face of the fact that branding was simply not a priority for any baseball team owner in that era—with the exception of the Chicago Cubs' Philip K. Wrigley, an advertising and marketing pioneer via his stewardship of the Wrigley chewing gum empire. The origins of the Yankees' top hat logo can be attributed to the fertile mind of Larry MacPhail and to the skilled hand of Lon Keller. MacPhail passed away in 1975, Keller in 1995. Together they created a billion dollar trademark that has stood the test of time.